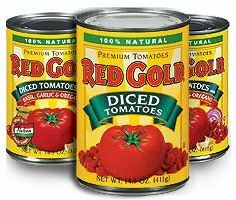 Red Gold Tomatoes Prize Pack Giveaway! Fine Print: I was given a prize pack and Red Gold is giving another to a reader. All opinions and statements below are my own. Red Gold has been around since the 1940s growing tomatoes in Indiana, Ohio and Michigan, where true seasons positively impact flavor — with just the right angle of the sun, perfect temperature, and soil that seems made for growing tomatoes. Red Gold is encouraging families to have a hot meal waiting after a busy school/work day. Using tomatoes in soups, stews and casseroles may also offer more nutrition than fresh. When tomatoes are heated, the antioxidant lycopene (linked to several health benefits) is released. Place the uncooked pasta in the bottom of a 3.5-qt. crock pot that has been sprayed with cooking spray. Add the remaining ingredients, except RED GOLD® PETITE DICED TOMATOES with GREEN CHILIES, to the slow cooker and stir until well combined. Cook on LOW for 4 hours. Just before serving add RED GOLD® PETITE DICED TOMATOES with GREEN CHILIES; stir to combine. To get everyone excited about the harvest season, I am giving one lucky winner a Red Gold Tomatoes Prize Pack! To enter this giveaway, complete any or all of the options listed below. Giveaway ends 10/2. Good luck! I love to make tomato soup. I make beef stew with tomato sauce. I love making homemade chili in the slow cooker. My favorite slow cooker recipe is Chili! We love chili! I love making chili in the slow cooker! I like homemade pizza sauce simmering in a crock pot. Homemade dirty rice, soups/stew and taco meat. Chili is my favorite, probably because it’s the easiest. But I agree – we use a ton of canned diced and crushed tomatoes in the crockpot! I love to make Vegetarian Chili with tomatoes. My favorite is Spicy Chili with tons of tomatoes! Probably Chili although I’ll be looking for others this year! THanks! My favorite tomato base recipe is stuffed green peppers!